When King Edward VIII abdicated the throne to marry Wallis Simpson it was scandalous. When the Alberta government abdicated the regulation of Alberta’s natural resources to an industry-led agency nobody raised an eyebrow. The new Alberta Energy Regulator (AER) is 100% funded by industry. It’s chaired by an industry lobbyist, Gerry Protti, and managed by a former deputy minister, Jim Ellis, who achieved notoriety when his department illegally barred environmentalists from participating in energy project applications. This less than inspiring crew is investigating the CNRL Primrose problem. CNRL, a global oil and natural gas company, uses fracking to extract bitumen at the Primrose oil sands site near Cold Lake Alberta. CNRL injects steam under high pressure into a reservoir. The heat softens the bitumen, the water separates it from the sand and the pressure creates cracks through which the bitumen flows back into wells which bring it to the surface. In 2013 CNRL had four uncontrolled bitumen releases—seepages that made their way to the surface. Similar large and uncontrolled releases occurred in 2009 and 2006. CNRL reported the first two releases to the AER on May 21. It reported the third on June 8 and the fourth on June 24. It was only after CNRL’s fourth report that the AER issued a bizarre press release saying it would “hold the responsible party accountable for the incident and its impacts.”* Responsible party?? Let me guess…CNRL? 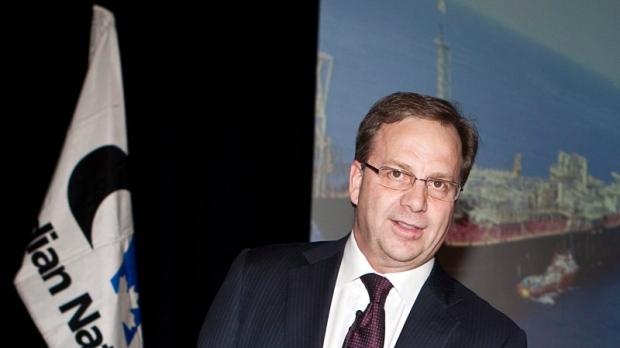 CNRL didn’t know what caused the releases but assured its shareholders that production at Primrose would be unaffected. In July the AER ordered CNRL to suspend steaming on part of the site and restrict steaming on another and to enhance monitoring and accelerate cleanup. Jim Ellis, the AER’s CEO, described these measures as precautionary, noting that “there have been no risks to public safety”. ** A bold statement given that the AER had no subsurface groundwater test results in hand at the time. CNRL said the cause of the release was “mechanical” (ie caused by wellbore failure) and assured its shareholders that the Primrose Problem would not impact its annual thermal in-situ production results. On Sept 24, three months after CNRL first reported the releases, AER issued an Environmental Protection Order requiring CNRL to drain a 53 hectare lake in order to mitigate the impact of the release. Jim Ellis, AER CEO, once again spoke on behalf of the company. He said that seepage was expected to continue indefinitely until the pressure in the reservoir subsided. It’s not clear who the royal “we” was, but it certainly wasn’t CNRL who immediately rejected the suggestion that the cause could be a reservoir issue and repeated its assertion that the cause was “mechanical” (defective wellbores). On October 21, the AER finally issued an Environmental Enforcement Order requiring CNRL to determine the impact to subsurface groundwater and find the root cause of all four bitumen releases. Now we’re getting somewhere. This will bring the causation issue to a head. Is it defective wellbores (a relatively easy fix) or a reservoir issue which could shut down the Primrose reservoir and negatively impact CNRL’s bottom line? At its third-quarter investor call, CNRL president, Steve Laut, described the Primrose problem as “a technical, operational challenge that is totally solvable.”****Another way to put this is: we’ve had seepage problems since 2006 and haven’t done a thing about it, but rest assured it’s NOT a reservoir problem. He outlined the steps CNRL will take to avoid seepage in the future: (1) examine 31 legacy wells and repair if necessary, (2) set up an “enhanced monitoring” system to identify “infrequent subsurface release signals from the Clearwater in the Grand Rapids” and trigger an “enhanced response” and (3) modify the steaming process. Ah, could you run that second one by me again, slowly? Apparently three major rock formations act as barriers preventing bitumen from escaping from the Clearwater Sands formation. These are the Clearwater Shale formation, the Grand Rapids zone and the Colorado Shale Group. If by some fluke bitumen does escape from the Clearwater Sands formation into the Clearwater Shale formation and from there finds its way to the Grand Rapids zone, CNRL’s “enhanced monitoring” system will kick in and CNRL will reduce reservoir pressure so the bitumen can’t go through the last barrier, the Colorado Shale Group. Having said all that, if CNRL fails to register the seepage on its “enhanced monitoring” system, the bitumen can travel through cracks in Grand Rapids and Colorado Shale to the surface. But CNRL is confident this will never happen unless there’s a defective wellbore lying around waiting to carry the bitumen to the surface. What about the ERCB report? In other words, the ERCB found a “reservoir issue”. CNRL is adamant that these four releases are a “mechanical” problem resulting from faulty wellbores. The ERCB is on record saying the 2009 Primrose release was not caused by wellbore failure but a “reservoir issue”. And it’s up to the AER to review the evidence and decide whether the four releases are a “mechanical problem” or a “reservoir issue”. Which way do you think the industry dominated AER will go? Right. And that’s why the Alberta government’s abdication of its regulatory responsibility is beyond scandalous. It’s reprehensible. This entry was posted in Energy & Natural Resources, Politics and Government and tagged AER, Alberta Energy Regulator, CNRL, Gerry Protti, Jim Ellis, Primrose oil sands. Bookmark the permalink. I think the poster held by Mike Hudema in this article by Graham Thompson says it best. Seems we are losing that fight on both the Federal and Provincial levels. Great photo Neil–the look on Alison Redford’s face as she walks past the Greenpeace activist Mike Hudema is priceless! I’m impressed with the coverage the Journal’s Grant Thomson and Sheila Pratt have provided on this story. Wish I could say the same for the Calgary Herald. Nicely written explanation of the problem, including CNRL’s unwillingness to address it and the regulator’s inability to regulate. On the upside, I hear huff-and-puff bitumen will finally give our drinking water that gritty-and-gooey sensation that I have always found fracking… errr… lacking. Not even sure of what to say about your post. It is a disgrace that people that have the responsibility of running this great province actually behave this way. It is truly mind boggling. How do these people expect us to react to this? To believe they are working to protect our interests? Is it even possible that they believe anything at all that makes sense? When deep pocket special interests own government, they can do anything they want and that’s what they do. So true Ted. The AER is fully funded by industry and run by an industry lobbyist. It’s scooping up some of the best government environmentalists, fish and wildlife officers, forestry officers, biologists and rangers and in some cases is paying them 25% to 80% more than they made in government. Mr Ellis, AER’s CEO, expects to hire an additional 8% to 12% staff within the next 18 months in order to meet industry’s demand for fast application approvals. Seems a tad hypocritical for the government and industry to dump on the ERCB, Environment, Public Lands and Energy for failing to process applications fast enough only to turn around, boost pay scales and hire up to 12% more staff after they’ve privatized the agency. Hardly an apples to apples comparison. Another great blog, Susan. The CNRL Primrose blowout saga points to so many issues but probably most importantly to my mind is how inadequate Alberta’s regulation of the oil and gas industry now is. There may well have been a time when operations were more straight-forward and hence less environmentally threatening and our regulatory system really was either up to snuff or close to it. (I’ve always had misgivings, especially vis a vis public participation and the regulatory system’s built in bias towards development.) But those days have long passed. Many Albertans have understandably lost what trust they may earlier have put in the regulatory system. And to make matters worse, our regulatory agencies continue to treat ordinary Albertans not as citizens entitled to full disclosure on what is happening to their lands and with their resources, but as bothersome meddlers. When the AER was asked why it had not revealed the CNRL Primrose blowout earlier, the response was that the agency had not thought Albertans would be interested in it. What? Really? What universe do these people operate in? Thank you Janet. As you point out when the Redford government jettisoned the old regulatory regime and replaced it with the industry dominated AER, the interests of ordinary Albertans fell off the radar screen. The “public interest” test was eliminated and only those who can show they’re “directly affected” are allowed to participate (assuming the government hasn’t bounced them out for some cockamamie reason). What really troubles me is when the AER advocates on behalf of industry. When Gerry Protti, the AER chairman of the board, prattles on about the impact of the AER’s order to limit steaming on CNRL’s cash flow, you can’t help but wonder who he thinks he’s working for–the company or the public. Indeed, such comments by Protti provoke exactly those questions. To whom does he think he is accountable? As an employee of a public agency, he is accountable to the public but the fact that industry covers 100% of the costs of his agency clouds the issue. It shouldn’t but psychologically we can see that it does. It’s a sad state of affairs.